There’s always a place for chives in our herb garden — they’re among the first to poke up in spring, and their leaves are best used snipped fresh and full of their delicate allium punch. To keep them going throughout the season, we cut the straggly plants down to the ground once or twice during the summer to revive them, but not before we have a chance to harvest their edible flowers. We’re accustomed to pinching the blossoms to separate them into tiny florets, and use them much as we would the leaves. However, it was with a fistful of them in hand that we began to consider the possibility of using the blossoms intact. 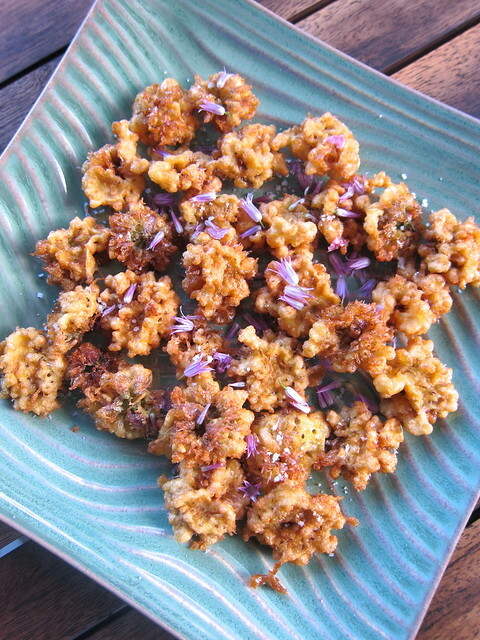 Since biting into a entire blossom can be a ticklish affair, frying them up as fritters tames their slightly prickly nature, and transforms them into airy clouds with a hint of oniony crunch. The batter we based ours on has a thin consistency, more like one for crepes than pancakes, and is let to sit to give the gluten time to relax. We left the stems on, more for ease of dipping into the batter than for appearance, then clip them off at the base of the blossom, and let them drop into a shallow pool of hot oil. They quickly puff up, and are given a turn to brown evenly. Once the whole batch was done frying, a simple garnish of sea salt and extra florets was all that was needed. To make it into a more substantial meal, we put together a salad of greens tangled with thinly sliced radishes, tossed it with a creamy buttermilk-chive dressing, and piled the chive blossom fritters on top. Later in the season when the garlic chives flower, it’s easy to imagine repeating this all over again. – In a small bowl, mix the flour and the eggs with a fork. While pouring the milk in a thin stream into the bowl, continue whisking with the fork until well mixed. Add a drop or two of vinegar, and whisk well until the batter is slightly frothy with trapped air bubbles. Don’t worry if the batter is lumpy, the flour will sort itself out as it sits. Cover and let the batter sit 30 minutes, or preferably overnight, refrigerated. When ready to use, whisk the batter again to reincorporate. – To fry fritters, heat about ½ inch of oil in a small frying pan. Withe two or three blossoms at a time, hold them by the stems and dip into the batter. 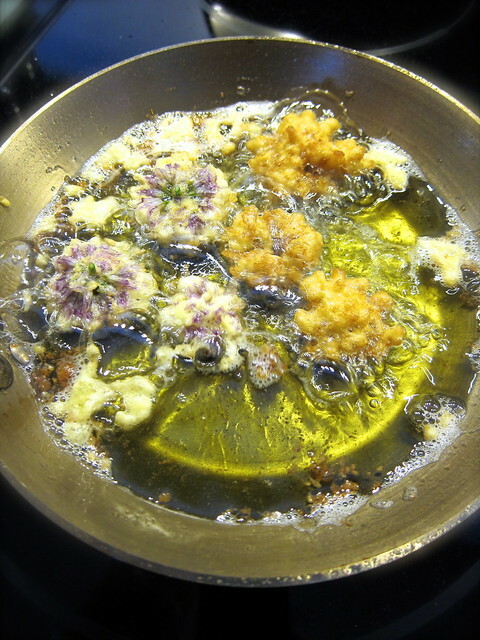 Let the excess batter drip off, then cut with a pair of kitchen shears and let the blossoms drop into the hot oil; avoid cutting too closely to the blossom end or it will fall apart in the oil. Flip the blossoms to brown evenly, then remove and let drain on paper towels. Garnish with a sprinkling of sea salt and fresh chive florets. – Whisk ingredients together to form dressing. Alternative, toss everything in a blender or food processor, and pulse until well blended. Adjust seasonings to taste. Local ingredients: Whole wheat pastry flour from Brookford Farm; eggs from Stout Oak Farm; homemade buttermilk and yogurt, with milk from Harris Farm; green garlic from Meadow’s Mirth; cider vinegar from Sewall Orchard; sea salt from Maine Sea Salt; chives and their blossoms from the garden. Submitted to Weekend Herb Blogging, edition #439 hosted by Torta di Rose. This entry was posted in cooking and tagged blossoms, buttermilk, chives, dressing, fritters, salad, salad days. Bookmark the permalink. Fascinating. I didn’t know you could eat the chive blossoms. 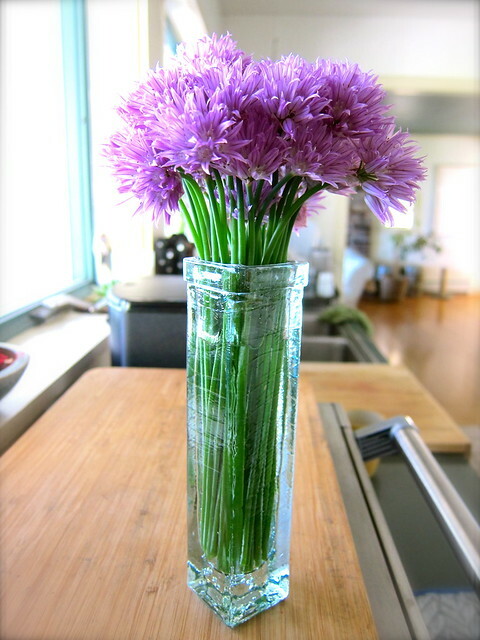 We’re slowly learning which of the blossoms are edible, and chives are a great one to start with! We’ve been removing the blossoms to keep the plants going, and this turns out to be a great way to use what would have been composted! Two great ways of using chives. The fritters look adorable. I have put flowers in bread dough and also used the to flavor (and color) vinegar. Well, hello. I’ll be making this for dinner tonight thankyouverymuch. I was going to put them in some vinegar as a last resort. They’re good sprinkled on scrambled eggs too! Hmm, chive blossoms. What an interesting idea…. Wow, what a lovely treat to visit your blog after a long absence. Positively put a smile on my face. The roundup is on line!